In A Short History of Nearly Everything, he takes his ultimate journey–into the most intriguing and consequential questions that science seeks to answer. It’s a dazzling quest, the intellectual odyssey of a lifetime, as this insatiably curious writer attempts to understand everything that has transpired from the Big Bang to the rise of civilization. Or, as the author puts it, “…how we went from there being nothing at all to there being something, and then how a little of that something turned into us, and also what happened in between and since.” This is, in short, a tall order. 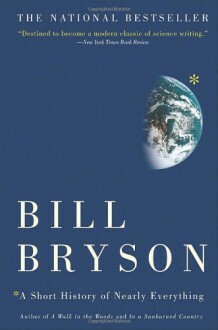 On his travels through space and time, Bill Bryson encounters a splendid gallery of the most fascinating, eccentric, competitive, and foolish personalities ever to ask a hard question. In their company, he undertakes a sometimes profound, sometimes funny, and always supremely clear and entertaining adventure in the realms of human knowledge, as only this superb writer can render it. Science has never been more involving, and the world we inhabit has never been fuller of wonder and delight. I've been wanting to read this for ages and it didn't disappoint. It was mostly very clear and easy to understand and in places, very amusing! Fantastic overview of the world designed to be consumed by science and non-science people alike. I feel quite small.